All Warhammer Age of Sigmar's ease of play is compromised by two very strange choices around player turns and how you use models. Each round of two turns, players dice off to see who goes first. Yes, that means if you took the prior turn you get to take another in a row. That means you get two volleys of crucial ranged attacks and maneuvering, and two chances at your swingy charging, before your opponent got one. It is not interesting nor fun design, and in my experience games where a player got double turns in the first two or three rounds always ended with that player winning. The other big problem comes from measuring. A model is the only thing that "exists" on the table - not, as in most other games, the model's standardized base. This leads to some odd situations, like players turning their figure's protruding weapons away from the enemy so they have a harder time getting into Â½ inch of you after charging, or having a figure's base overlapping another figure's base and canting it at an odd angle in order to make your charge legal. Had I spent hours painting the figures, I can't say I'd be very happy about the way you have to treat them just to play the game. The game's simplicity leads to an environment that, simply put, isn't tactically complex. After some initial jockeying for positioning, a battle devolved into one or two big smushes of units rolling against each other until one side ran out of models. It's hard to conclude whether that's a product of the rules or a product of the armies included, though I can't see too much happening with fancy rules on new miniatures that would change these outcomes. 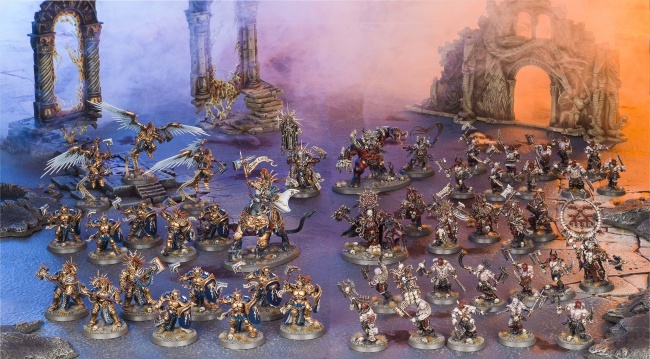 The Stormcast Eternals army is the more tactically interesting of the two included, with a bit more variety of unit functions among it: Heavy hitters, frontline troops, special characters, and flying quick hitters, each with a clear and distinct role - though in the end the objective of "hit the most while getting hit least" was the best choice. The Khorne Goreblade Warband is much less interesting and far more optimized to do one thing: Get in a big blob, get into melee, and hope you roll better than the other guy. They have powers to use, but all their powers aid in that one goal above all others. Oh, and, I suppose it's worth noting that the special powers and rules here have none of the silliness we've seen in Age of Sigmar rules for older models. The stats for the two armies are incredibly similar, as well, making the game most devolve into getting into melee and then rolling either higher than 3 or higher than 4 on a pool of dice, with the occasional exciting segue into rolling higher than 5! As a representative sample of a 'balanced' game where no single army is much better than another, it's perhaps too balanced. Balanced to the point of mostly bland, samey slugfests which often come down to two or three figures on each side smacking each other over and over for victory. Without some innovation on your part, or some free scenarios from Games Workshop, don't expect to get more than ten or so hours of play - that figure includes a couple replays of the later scenarios - from this box set before you're done. Bottom Line: A good introduction to an average skirmish game attached to great miniatures and generic-to-confusing lore. Recommendation: It's a decent deal for the models, and the production quality is superb all around, but don't expect to fall in love with a new game from this set alone.